nspired is the only word that can describe Atlanta designer Bill Cook’s home in the Blue Ridge Mountains of Highlands, North Carolina. With an amazing mix of reclaimed barn beams, stone, and poplar bark, architect Michael Faust has created a ‘Storybook’ inspired cottage perched high on a hill overlooking Mirror Lake. 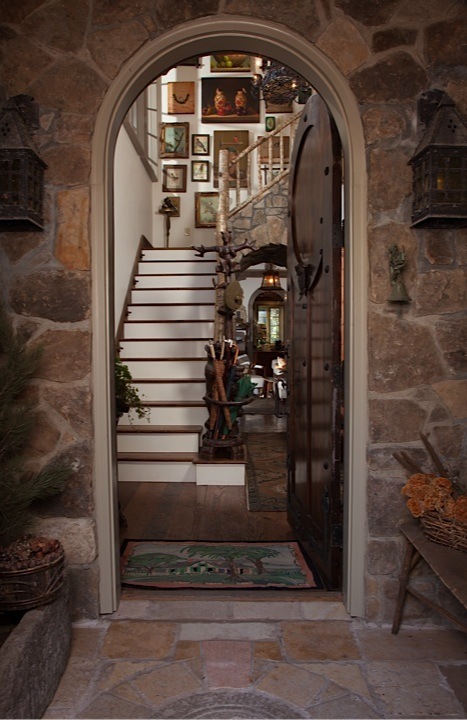 Over the next few posts I will take you on a guided tour of the home–so grab a cup of coffee, a warm blanket and nestle in for all of the charm—starting at the front door. 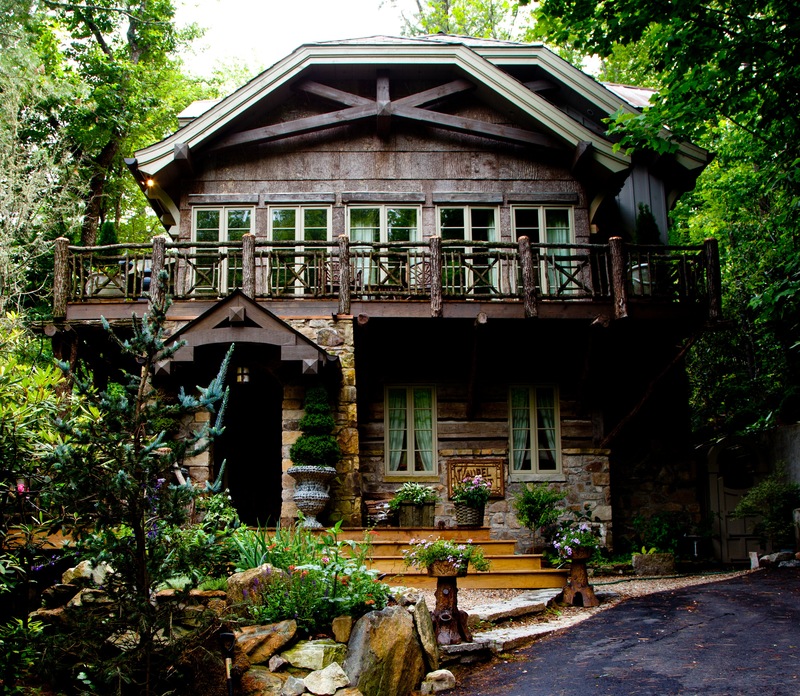 This home is featured in the current issue of Atlanta Homes & Lifestyles. Also, Bill and Michael’s company, Vermilion Designs, will be having an Insider’s Event in association with the magazine, ‘Vintage and Designer Picks: Cabin and Lodge’ on One Kings Lane starting Sunday, November 18th at 9:00 pm. It will feature a wide range of 18th, 19th and 20th century one-of-a-kind antiques. Check it out and shop ’til you drop! Charming cottage perched high on the hill–love every inch of this one! Welcome! The custom doors are Alder and were finished on sight. The two story entry and staircase are decorated with a Black Forest coat rack for a newel post and ‘bear’ lights to guide your way. Looking back to the entry you see the amazing windows and three chandeliers! 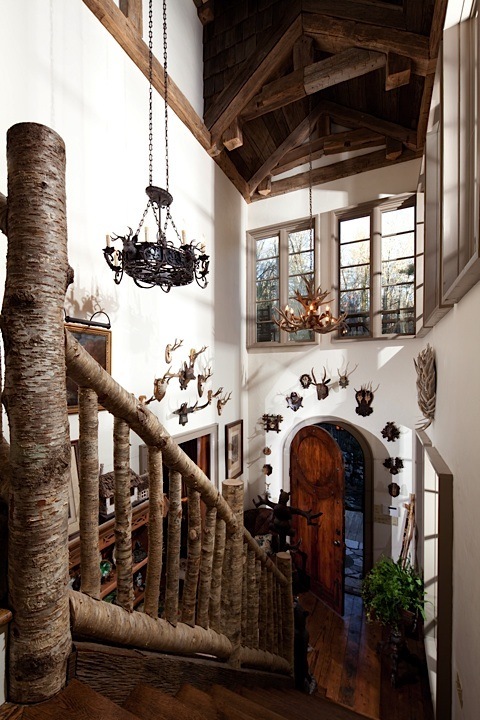 I love the antlers surrounding the front door and over the bedroom door to the right. All of the stair rails were made from local wood. 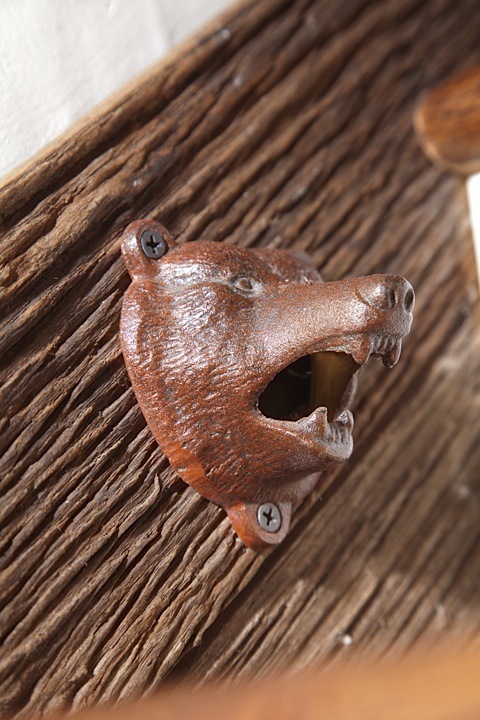 Charming ‘bear’ lights made from bottle openers light your way up the stairs. 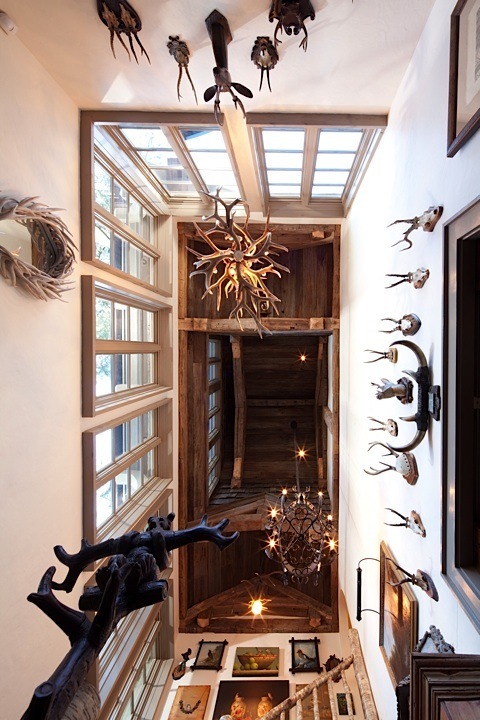 Looking up into the entry ceiling–beautiful old barn beams and windows soar up 32 feet. 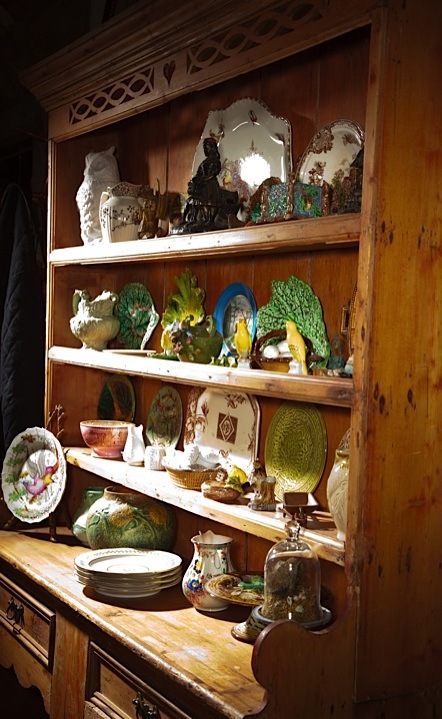 This pine dresser is overflowing with majolica and small collections–not an inch was forgotten in this home design. Much, much more of this charming cottage to come in the next post. Check back soon! Thanks for bringing these wonderful images our way…absolutely love this place and the Black Forest vibe…can’t wait for the next post! Thank you Jermaine! I will be posting the guest room next. This place is so inspiring.